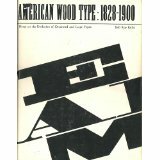 American Wood Type 1828-1900: Notes on the Evolution of Decorated and Large Types and Comments on Related Trades of the Period. Kelly, Rob Roy. The classic reference on 19th century American wood type. Book Description: New York: Van Nostrand Reinhold Company, (1969), 1969. First edition. 4to; 350 pp. ; illustrated. A good copy in original black cloth, in a good dust jacket with small tears at bottom and top. Enclosed in plastic sleeve. Newspaper clipping of Kelly’s death in 2001 included inside front cover. No marks or missing pages. Binding is solid. Price $250 or BO. Shipping extra. More information can be found here. This is the same book as the fourth from the left.